There’s a lot of buzz around Boulder about the new apartments being built at Pearl and 30th Street. in Boulder. Here at Housing Helpers we field calls on a daily basis from both Boulderites and those soon-to-be Boulderites that are interested in learning what the newest apartments in Boulder will offer. We are constantly tracking the apartment rental market in Boulder, so here is the latest update on what you might expect from new Solana 3100 Pearl Apartments in Boulder. Solana 3100 Pearl Apartments is expected to open in the late fall, early winter, of 2013 with the first apartments ready for move-in around December 1st. These new Pearl Street Apartments are described as luxurious studio, one, and two bedroom urban apartments infused with high-end finishes and top-notch amenities. The Solana apartments are pet friendly, and that’s a good thing because we know how Boulderites love their four legged friends. 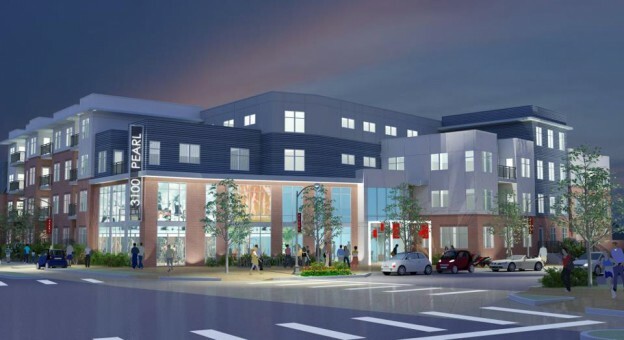 These new apartments won’t be lacking for amenities either, with fitness amenities such as spin room, yoga, and pilates studio fellow Boulderites will have what they expect to stay fit and enjoy the Boulder lifestyle. Into organic foods? No problem when you live at Solana 3100 Pearl Apartments, Whole Foods Market on Pearl street is only a block away! Did we mention the 29th Street Mall is also right around the corner? An array of dining and shopping lies just outside your door. Boulderites love the environment and make choices to protect it whenever possible. Following suit, the Solana 3100 Pearl Street Apartments is a fully entitled Boulder Green Points project. The Green Building and Green Points Program encourages the use of sustainable remodeling and building methods and technologies to conserve energy, water and other natural resources. The Green Points Program applies to all new residential construction. This program requires applicants to earn “points” by selecting green building measures in order to receive a building permit. That’s the latest scoop on the new Solana 3100 Pearl Street Apartments in Boulder. For more information or to find your next apartment in Boulder call Housing Helpers, Boulder’s most popular rental locator and Boulder apartment finder service! This entry was posted in Boulder and tagged 29th Street Mall Apartments, Boulder Transit Center Apartments, Boulder Transit Village, Luxury Apartments, New Apartments, Pearl Street Apartments, Solana 3100 Pearl Apartments on July 10, 2013 by John Iannone.